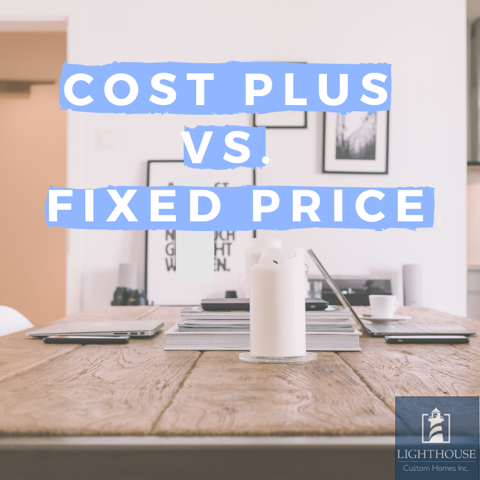 What is the difference between Cost Plus versus a Fixed Price? When it comes to building your home, there are many decisions to be made. One that can be a little ambiguous is the cost versus fixed price question. What makes the most sense for you and your situation? Cost: The exact cost to purchase a product or service from the trade partner or supplier. Plus: The percentage that you will pay the builder for their experience, knowledge, and service to coordinate the build of your home or project. Contingency: a provision or amount set aside for an unforeseen event or circumstance. Admin Fee: This is usually a fixed rate that the builder or contractor charges for service above and beyond the “Plus percentage.” If a builder has an estimator, site superintendent, designer, etc. on staff, they will not get a direct invoice per job for the service and will lump this cost into an admin fee to cover their costs. Fixed Price: The contract price on the agreement does not change unless agreed upon and signed for. In the Calgary building industry, cost plus percentages can range anywhere from cost plus 12% to cost plus 25%. A typical amount is a cost plus 15%. If it’s less than 15% expect an admin fee, or look further into the actual cost. Some contractors and builders inflate their costs to make it look like they are more than they are. This is unfortunate. The best way is to determine this if you are going the cost plus route is to compare costs with other builders trade partners and suppliers to confirm numbers are comparable. Who takes the risk is the main difference between cost plus and fixed price. With a cost-plus, you as the client are taking the risk if any unforeseen costs emerge. For example, if lumber or drywall increase before you have locked in your price, you would be on the hook for that expense. On the other hand, if costs we to go down, you reap the savings. This is a great option if you feel confident in a stable pricing market and your site or lot does not have any possibility of unforeseen costs. With a fixed price, the builder takes the risk. If drywall goes up, the builder would be on the hook to cover the cost as your price will stay the same from the day you sign the contract. The builder will typically add in a small contingency to protect themselves. The benefit of a fixed price is you have certainty in the exact cost of your new home and can plan for your future with more clarity.